Agency is super flexible portfolio WordPress theme enabled with fullscreen home page and suitable for creative agencies, freelancers, any kind of business, photographers and portfolio websites. Agency theme has 100% responsive layout, built using Zilla framework and compatible with most of the popular WordPress plugins including zilla shortcodes, zilla social, Zilla likes and Zillashare. Available with 2 portfolio layouts and enabled with accent colour control using colour picker without touching single line of code. 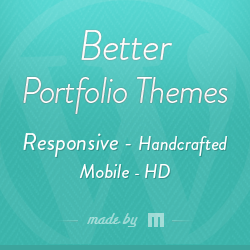 Agency portfolio WordPress theme has 6 post type templates, 2 page templates and enabled with blog sections. Its search engine friendly, cross browser compatible WordPress theme supports multilingual translation using .PO and .MO files included with agency theme. Compatible with latest WordPress version 4.0, bundled with all PSD files used to develop this theme and supports 600+ google web fonts for super clean typography.